Finnish driver Heikki Kovalainen  will join Lotus F1 Team for the final two races of the 2013 season as a stand-in for regular race driver Kimi Räikkönen, who is currently undergoing back surgery. Heikki – a veteran of 109 grand prix starts – has previously driven for Renault F1 Team, McLaren, and Caterham F1 Team. Over the course of his six seasons in Formula 1 to date, Heikki has scored 105 World Championship points. He has qualified on the front row five times, taken one pole position at the 2008 British Grand Prix, achieved two fastest laps and finished on the podium four times; including victory at the 2008 Hungarian Grand Prix. Prior to racing for Lotus F1 Team in its former guise of Renault F1 Team in 2007, Heikki performed various test duties for the squad from 2004 – 2006. He completed his seat fitting at Enstone on Wednesday 13th November, before proceeding directly to Austin to join up with the race team. 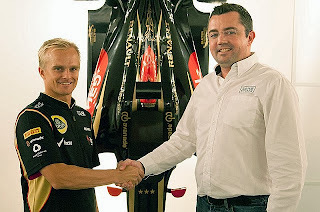 Heikki Kovalainen, Race Driver, Lotus F1 Team: “It is a fantastic opportunity for me to join Lotus F1 Team for the final two races of 2013. We’ve seen this year that the E21 is a car which can win races and finish on the podium, so I will be pushing hard for the best results possible.